Continuous improvement is a philosophy with the objective of creating a culture that allows anyone on the team to make or suggest improvements to a product or process at any given time. So, whether you accept and implement improvement suggestions immediately, or if you do it at the end of each sprint, the key is to accept input from everyone on the team and to make ongoing iterative improvements to the development process, workflow, toolset, etc. The objective of this phase is to identify and prioritize opportunities for improvement. 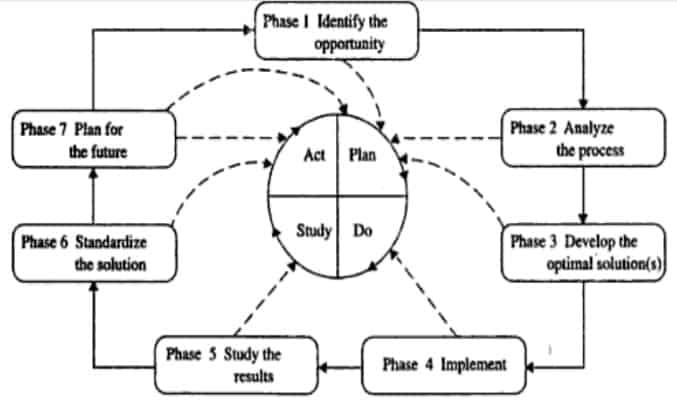 The objective of this phase is to understand the process and how it is currently performed. Key activities are to define process boundaries outputs and customers, inputs and suppliers and process flow, determine levels of customer satisfaction and measurements needed, gather data and identify root causes. Establish performance measures with respect to customer requirements. Establish regular feedback with customers and suppliers. Establish measures for quality/cost/time of inputs and outputs. Once the target performance measures are established, the team can collect all available data and information. Enables the team to measure the effectiveness of an implemented solution. What problem or operation do we want to learn about? How many data are needed? What conclusions can be drawn from the collected data? What action should be taken as a result of the conclusion? The objective of this phase is to establish potential and feasible solution and recommend the best solution to improve the process. Once all the information is available the project team begins it search for possible solutions. Once the best solution is selected it should be implemented. This phase has the objective of preparing the implementation plan, obtaining approval and implementing the process improvements. Although the team has the authority in implementing the solution but it has to get approval from the quality council. If such approval is needed from the quality council, the team has to give a written or oral report. Why will it be done? The length of the report is determined by the complexity of the change. Simple changes may require only an oral report, whereas other changes require a detailed written report. This phase has the objective of monitoring and evaluating the change by tracking and studying the effectiveness of the improvement efforts through data collection and review of progress. The team should meet periodically during this phase to evaluate the results to see that the problem has been solved or if fine tuning is required. If the team is not satisfied, then some of the phases will need to be repeated. Once the team is satisfied with the change, it must be institutionalized by positive control of process, process certification and operator certification. Positrol (positive control) assures that the important variables are kept under control. It specifies that what, who, how, where and when of the process and is an updating of the monitoring activity. This phase has the objective of achieving improved levels of process performance. Everyone in the organization is involved in a systematic, long term endeavor to constantly improve quality by developing processes that are customer oriented, flexible and responsible.